Finished the faceless bunny. This will head out to England to be a fund-raising item for a rabbit rescue. I left off the face, someone else volunteered to do that for me. Also left off the pompom tail. 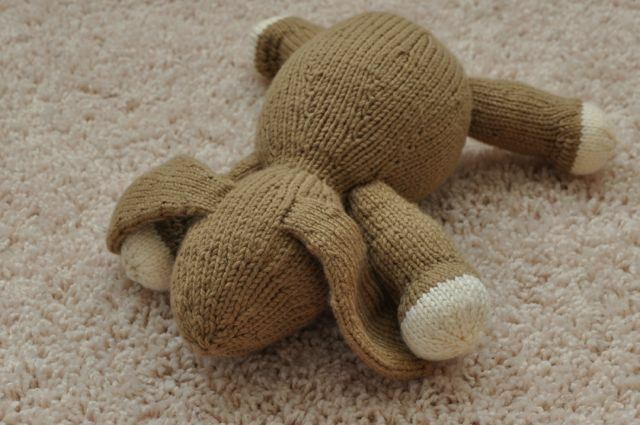 I didn’t use a full skein of the brown yarn, so I have plenty to make a second rabbit, or a small bear (Ravelry link), or a bigger bear (Ravelry link) from the same designer. I have reached the halfway point on my bag of toy stuffing after at least seven years. Shows how much I make things that need stuffing. You knit this at a pretty tight gauge, and the first few rows after picking up stitches for a new piece are not easy, but the end result is good. Aw, I love the little ‘socks’ on his feet! He’s adorable. Even without a face!